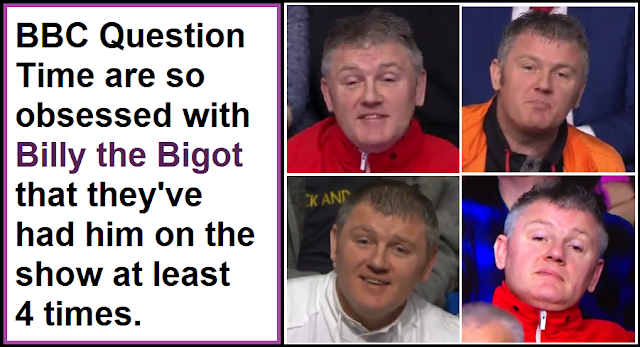 Why do Question Time love Billy the Bigot so much? BBC Question Time is a remarkably biased show. Regular viewers will be familiar with the regular appearances of Tory Party plants in the audience, and they'll also be familiar with the way the panel of five guests is always heavily loaded in favour of pro-austerity neoliberals, and the way that left-wing panellists are hectored and interrupted far more than right-wingers. However the episode on February 7th 2019 was quite extraordinary with the notorious Billy "the bigot" Mitchell making yet another appearance as one of the select few audience members allowed to ask a question. Billy Mitchell is an orange order supporting former UKIP candidate with a long track record of spouting extremely right-wing British nationalist bile. Wings Over Scotland has more details on the four appearances, and Billy's extraordinary bigoted, sectarian, British nationalist, pro-Trump, anti-EU, pro-Putin, orange order, creationist views. Of course a minority of the Scottish public are actually orange order supporting sectarian bigots like Billy, and they should be allowed to express their views (even if they are despicable) but how on earth have the BBC decided that this tiny sectarian demographic in Scotland should be represented by the same man as if he's just a random member of the public rather than someone they've repeatedly selected to represent orange order bigotry on national television? The odds against being selected to speak on the show more than once are very high, but when someone's been selected as a speaking audience member on at least three occasions the odds are simply too high for it to be a coincidence. 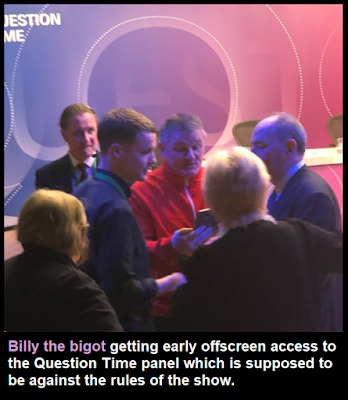 But there's no need to rely on the mathematical improbability of being selected as a speaking member of the audience on so many occasions, because pictures from before the show reveal Billy the bigot getting offscreen access to at least one member of the Question Time panel (something that isn't supposed to happen according to the show's own rules). There is clearly a very serious problem with the methodology the BBC are using to determine the makeup of Question Time audiences, and to decide which audience members get picked to ask questions of the panel. And there's obviously a very serious problem with their selective enforcement of their own rules when it comes to certain politically partisan far-right audience members being given off air access to the panel before the show, whilst ordinary members of the public are expected to abide by the rules. The woman in charge of picking the Question Time audience is Alison Fuller Pedley who has an extraordinary track record of controversy including sharing Britain First content on her (now deleted) Facebook page, colluding with a UKIP councillor to bring Question Time to his home town, inviting the EDL street thuggery group to appear in the Question Time audience, and following the Facebook page of an extreme-right hate mob called the British Patriot Front. Whether she's a far right fanatic pushing her own personal agenda onto the show, or someone actively working to push extremist far-right ideas into mainstream political discourse it's appalling either way. But as is the way with big institutions, whenever people complain about her antics, or the obviously partisan audience selections the BBC go into 'circle the wagons' ultra-defensive mode. And whenever people ask about the exact process they use for deciding the balance of audience members on their politics shows, they refuse the Freedom of Information requests. The BBC has a "closed box" approach to their methodology for picking audience members and which audience members get to speak, the woman who runs this process has a concerning history of far-right activity, and they've just been caught red-handed giving an orange order bigot yet another speaking appearance on the show. But given their long track record of ignoring criticism over their lack of political impartiality (including the extraordinary case where they gave a question to an extreme-right fanatic who was facing jail time for a disgusting string of online abuse and death threats) it's highly unlikely that anything will be done to reverse this Question Time trend of deliberately promoting far-right extremist views into mainstream political discourse. As far as they're concerned far-right political views make cracking publicity for their show, hence the fact that they decided to actually Tweet Billy the Bigot's question, provoking absolute raptures from across the extreme-right online fringe. Not only do they think they're doing nothing wrong by rigging their audiences and questions in order to push extremist far-right views into the mainstream, they actually see it as their job to do this. Good points being made here about BBC bias, which so many of us have complained about and had no sensible response. However, I saw a comment on a Corbyn supporters' page from someone who was in audience the same night, who says that Billy the Bigot did not have access to the panel before the show; this photo was taken after the show was recorded, when he asked if he could pose for a selfie with one of the panel. Being congratulated, no doubt. And asked which show was he next going to be on! As someone that instinctively votes more to the right than the typical commenter here, I am, nevertheless, a little surprised/disappointed that the BBC have created this situation where an individual appears to be very "lucky" in getting themselves asking questions or making points on a less than "random" basis. Even more surprised that it is someone to the right in their politics. My more common reaction is that the audience appears to be biased towards the left, or when Brexit is being discussed, biased towards Remainers. Most panels tend to be Remainer biased as far as I can see. I am on the left but agree with the poster above regarding Brexit. That said it would be nice to get more left wing Brexiteers on the panel. Shame the two best ones (Bob Crow and Tony Benn) are no longer with us. 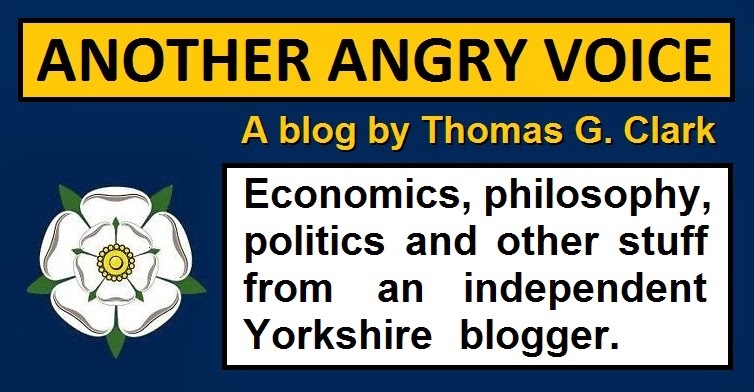 It would have been nice to see a deeper discussion of Brexit from a left wing slant (Lexit), and would help to nail the myth that Brexiteers are all thick and racist (of which plenty of right leaning Brexit voters clearly are not, never mind Lexit). It would be nice if you didn't conflate every single Leave voter with racist, right wing idiots. Thank you, but I shan't donate to your blog. The production team discusses questions with audience members beforehand, but the quidance members are not to discuss questions with panel members, or meet panel members, before the show.